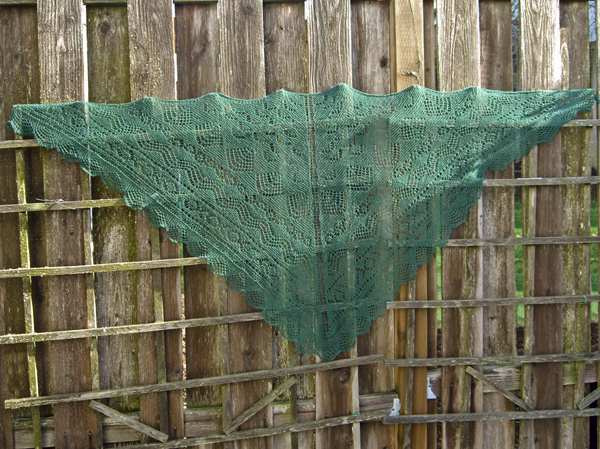 There was a brief moment of sun yesterday, and it was at the right angle to reach my yard, so I ran out and snapped some pictures of the Pacific Northwest Shawl. Sorry it took so long to get these, but light in Portland in the winter is an uncommon phenomenon. And my house is on the north side of a mountain. The top of the mountain is at just the right height to block the sun for most of the cold months. Very early morning and late afternoon are about the only times I might get light. If it’s not raining. The front yard gets a little sun, where it’s not in the shadow of the house. My yard in the winter is a cold, gloomy, damp and gray place. I’m from a part of the country where gloom is not normal. In southeastern Idaho, rain in the summer was unusual. It snowed in the winter. But it was usually bright and sunny after the snow passed. Sometimes there would be cloudy days. But in the winter, even when cloudy it’s bright because the sky is white and the snow is white and there’s a lot of light (although not much in the way of shadows, effectively killing depth perception). The first winter I lived in Portland, it was so dark and drab. I got used to seeing the world in black and white and gray. When the sun came out in the spring, I couldn’t believe what a bright thing color was! I’d never had anything to contrast it with before. I’ve never taken it for granted again. 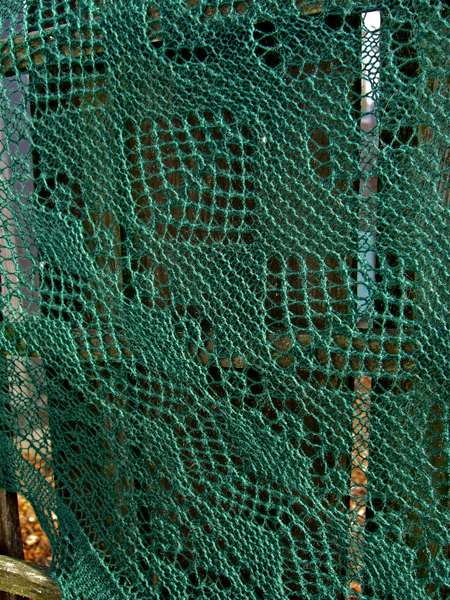 Here’s a closeup of the Pacific Northwest Shawl. Taking these fence shots was actually fairly interesting, as the day was breezy. The PNWS weighs almost nothing. It contains less than 2 oz. of yarn (maybe 50 grams). It’s held against the fence mostly by the wind — I’m not kidding here. There’s nothing holding it up. The top edge is resting against the ends of the lattice uprights. But that’s it. The breezes had a fun time rippling it and playing with the edges. I had to wait for brief breeze intermissions to take pictures that might (hopefully) be in focus. If you are reading in a feed reader, do go over to the blog so you can pop up the pictures and see the bigger version. I really don’t think the smaller size shows off the lace to best advantage. No, I’m not going to indicate the area that had to be mended because of the stitches that dropped during blocking. If you can’t see it… well, that’s sort of the point, isn’t it?